When student leaders gather from around the state to attend the Institute’s Leadership Seminar, in June, they spend each day listening to and learning from national, state and local leaders who share their insight about leadership principles, strategies and practices, particularly in the context of public service. They also are introduced to a comprehensive list of recommended reading for further study. The faculty at the Panetta Institute offers this sampling of works on how leaders have developed skills that have made a difference in public life, both currently and in history. Brooks, David. The Road to Character. David Brooks chronicles the shift in the United States from a culture of humility in the years after World War II to a culture that now encourages Americans to see themselves “as the center of the universe.” Brooks argues that the current emphasis on “resume” virtues rather than “eulogy” virtues not only is inimical to national greatness but, on the individual level, fails to produce enduring satisfaction. Random House, 2015. Ellis, Joseph. The Quartet: Orchestrating the Second American Revolution, 1783-1789. In The Quartet, Ellis tells the story of America’s second great founding—the creation of the Constitution and of the men most responsible—Alexander Hamilton, George Washington, John Jay, and James Madison. Vintage, 2016. Greenstein, Fred I. The Presidential Difference: Leadership Style from FDR to Barack Obama. 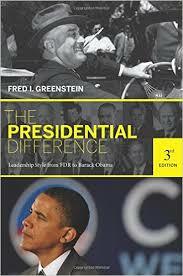 Greenstein provides an instructive account of the presidential qualities that have served well and poorly in the Oval Office. From Franklin Roosevelt to Barack Obama, he surveys each president’s political skill, vision, cognitive style, organizational capacity, ability to communicate and emotional intelligence. He argues that emotional intelligence is the most important factor in predicting presidential success. Princeton University Press, 2009. Hormats, Robert D. The Price of Liberty: Paying for America’s Wars from the Revolution to the War on Terror. An insightful overview of America’s budget policies during times of national crisis and how we have departed from the fiscal traditions of the past. Holt, 2008. Kissinger, Henry. World Order. In this book, Kissinger offers a deep meditation on the roots of international harmony and global disorder. Drawing on his experience as one of the foremost statesmen of the modern era—advising presidents, traveling the world, observing and shaping the central foreign policy events of recent decades—Kissinger reveals his analysis of the ultimate challenge for the twenty-first century: how to build a shared international order in a world of divergent historical perspectives, violent conflict, proliferating technology and ideological extremism. Penguin Books, 2015. McCullough, David. The American Spirit: Who We Are and What We Stand For. A collection of eloquent speeches by one of America’s most highly respected historians. Simon and Schuster, 2017. Miller, William Lee. Lincoln’s Virtues: An Ethical Biography. A penetrating analysis of Abraham Lincoln’s greatness and arguably one of the best books on Lincoln that has been written. Vintage, 2003. Panetta, Leon and Peter Gall. Bring Us Together: The Nixon Team and the Civil Rights Retreat. The gripping story of then-director of the Office of Civil Rights, Leon Panetta, and his attempt to enforce the 1964 Civil Rights Act, a legal responsibility that did not match President Richard Nixon’s “southern strategy.” The book chronicles the key events that then led to Secretary Panetta’s firing by the Nixon administration. Lippincott, 1971. Panetta, Leon and Jim Newton. Worthy Fights: A Memoir of Leadership in War and Peace. Reviews of Secretary Panetta’s book refered to it as an epic American success story, a great political memoir and a revelatory view onto many of the great figures and events of our time. Penguin Press, 2014. Sledge, E.B. With the Old Breed. Widely considered to be the best memoir by an enlisted man who fought in World War II. Presidio Press, 2007. Stevenson, Bryan. Just Mercy: A Story of Justice and Redemption. Stevenson was a young lawyer when he founded the Equal Justice Initiative, a legal practice dedicated to defending those most desperate and in need: the poor, the wrongly condemned, and women and children trapped in the farthest reaches of our criminal justice system. One of his first cases was that of Walter McMillian, a young man who was sentenced to die for a notorious murder he insisted he didn’t commit. The case drew Stevenson into a tangle of conspiracy, political machination and legal brinksmanship—and transformed his understanding, (as it will the reader’s), of mercy and justice forever. Spiegel and Grau, 2015. Zinsser, William. On Writing Well, 30th Anniversary Edition: The Classic Guide to Writing Nonfiction. This brilliantly written book combines erudition, wit and humor in a must-read for every serious young (and old) student of writing. The reader’s highlighted sections should then be re-read once a year. Harper Perennial, 2006.